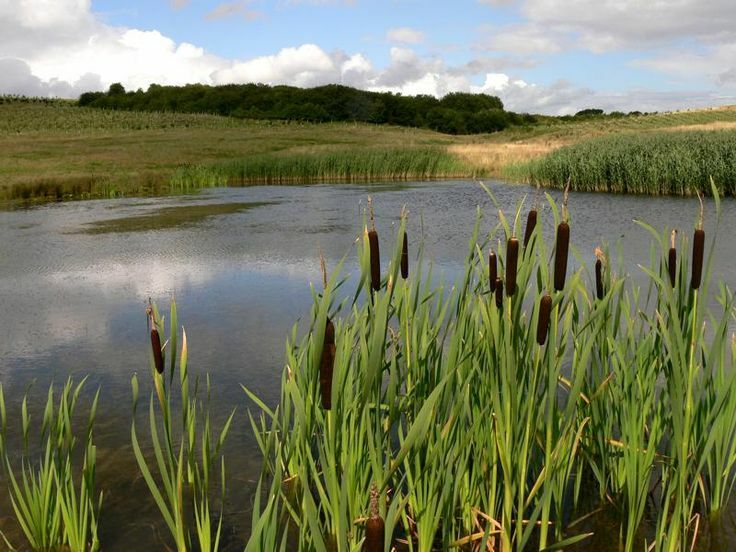 Wetland Plants - Also known as hydrophytic plants, are adapted to live and grow in water and are able to survive with decreased oxygen levels as well as fluctuating water levels. Some may be completely submerged, but others spread their roots in water while the rest of the plant lives above the water. Examples include cattails, duckweed, and reeds. Homeowners who have a naturally wet spot, a low area, or a drainage way with clay soil in their yard can benefit from creating mini-wetland. 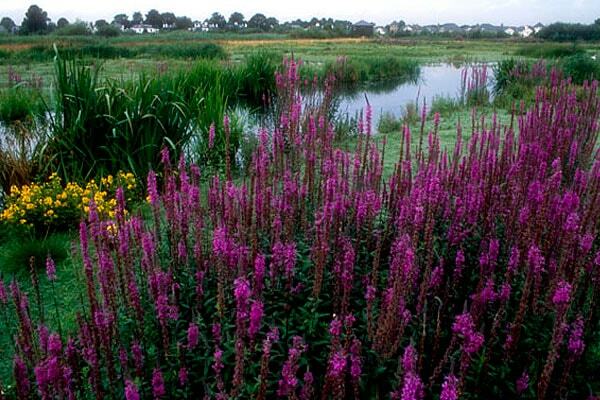 Even without such a place, wetland plants can still be added to a yard. Wetlands in a backyard can temporarily store and filter water that runs off water from a roof and yard. A mini-wetland can also provide a home for butterflies, bees, salamanders, toads, frogs, and birds.To create a mini-wetland, plants do not require standing water, which can be surprising to many people. In fact, wetland plants can survive in an area that seems dry most of the growing season.Simply put, a mini wetland is an area where the soil is covered or saturated with water for at least two to three weeks per growing season. Anywhere in a yard where water accumulates faster than it can be absorbed or drain away can serve as an ideal location. Most areas are covered with water for four weeks or less during the warmest months. Wetlands, also known as marshes, include different grasses, cattails, and other herbaceous vegetation. Wooded wetlands, which have mostly shrubs and trees, are called swamps.Homeowners must take into account the saturation of the soil and the length of time the area is wet when selecting wetland plants. Many small wetland plants can multiply in the moist, spring soil but may disappear in the heat of the summer when the ground dries up. Bulrushes, cattails, jewelweed, and cardinal flowers like places where the wet and dry periods alternate. These plants will also survive flooding if most of the leaves are not immersed in the water. Water lilies and pond weeds like to grow in permanently flooded areas.As for new wildlife establishing their habitats, toads and tree frogs will lay eggs, and the pollywogs will mature where water is available for about three to four weeks. Other frogs need more time. Permanent water usually means bullfrog pollywogs and small fish take over and stop the reproduction of most other toads, frogs, and salamanders. Top choices in wetland plants are pickerelweed, arrowhead plant, and cattails.In the end, a mini-wetland can be a unique and beneficial addition to any yard or garden. The ecological gains from wetlands are numerous and varied. As a boon to water quality and repositories of floodwaters, these landscape features are much more than just swamps. They serve as a home for myriad species of fish and wildlife, while acting as a drainage point and filter in larger watersheds. Central to these activities are the many forms of flora that grow in wetland areas. Without the presence of these valuable plants, to be sure, wetlands would have little relationship to the surrounding ecosystems. Fostering and--in some cases--re-introducing these organisms is essential for wetlands to fulfill their role. Among the beneficial wetland vegetation are trees. While wetland trees vary from region to region, some species are more common. Planting American sycamore (Platanus occidentalis) trees is best done in shallow swamps, river bottoms, and sloughs. Extremely tolerant of flooding, this tree provides seeds to songbirds (finches, e.g.) and fruit to fauna such as beavers, muskrats, squirrels and even white-tail deer. As the trees age, they convey shelter and cover to owls, chimney swifts and wood ducks. Salix babylonica is known to take root quickly and grow just as rapidly. Famous for its low-reaching branches and narrow leaves, the weeping willow is among the first to bear leaves and the last to lose them. It can grow to 40 feet in height and 35 feet in its span of branches. Rabbits, beavers, and deer enjoy a favorite nesting place for birds and small mammals, this tree's seeds, leaves, and fruit. Emergent plants are so called because they are rooted in soil that is typically underwater, but their leaves, stems and procreative components are above the surface. With long (four to nine feet), flattened leaves and distinctive flourishing spikes, cattails are thought by many property owners to be a problem. Given fast growth and reproduction, these plants tend to evolve into thick stands. In their native marshes, they harbor birds and fish and the insects upon which they feed. Their stems regulate the flow of water while snaring sediment and silt. Overall, cattails are excellent protection against erosion. A rush produces leaves that look like hollow stems, and its stalk is cylindrical. Fish, such as largemouth bass and yellow perch, spawn amidst its flowering vegetation. Also, snails--which themselves feed on rotting leaves--thrive in rushes and serve as food for a diversity of species. Certain rushes are also used decoratively in water gardens. This flora gains their nutrients from the water, and are not rooted in the soil beneath. Frogbit, water hyacinth, and water lettuce, for example, keep algae under control while providing needed shade for aquatic creatures. These are but a few of the many organisms that create and preserve a robust wetland ecosystem. Planting them strategically affords improved health to the natural world.